This is a versatile machine well-suited to estate life. 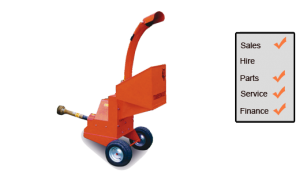 With a low centre of gravity, easy tow chassis and good ground clearance this machine has a positive blade feed action and large feed funnel, as well as the ability to quickly process 75mm to 100mm (3"-4") diameter material at up to 1.5 tonnes per hour. Ideally suited to tractors from 21hp to 35hp, it will easily tackle branches from 75mm (3") to 100mm (4") diameter, depending on tractor horsepower. The machine is fitted to a 'slow tow' chassis and does not require the use of the three point linkage.